Cold and overcast with occasional light rain. I slept on the table in the shelter last night which saved putting up the tent and packing it wet in the morning, but the wooden table was hard and I didn't sleep as well, so I think it will be back in the tent tonight. I got up at 6:30am on a very cold morning and was hiking by 8:30am. It was very overcast and everything was wet, but it wasn't actually raining. After a couple of hundred metres of foot trail, I emerged on a forest road that showed how close I had been to civilisation last night. A kilometre or two away, on the other side of Jounama Pondage, was the pretty alpine village of Talbingo, dotted with autumnal colour. However, close as it seemed, it was eight kilometres by road to get there, so I wasn't that close as a hiker. The next 10km was a detour from the official Hume & Hovell route which was closed because of a landslip. Warwick Hull, the trail coordinator, had told me in Tumut that it was one of the prettiest sections, following the route of a very old tourist road from Talbingo to Buddong Falls and that work was underway to reopen it. I'll have to come back. The detour followed a little-used forest road that climbed and followed a forested ridge. It was quite pretty eucalypt forest and, apart from having to negotiate my way around a number of huge puddles bordered by blackberries, and a very steep and long final climb, it was quite a pleasant walk. As is my early morning habit I listened to various current affairs programs on the radio as I walked. The presenter of ABC Radio National's "Life Matters" program between 9am and 10am each morning, is Natasha Mitchell who, as the daughter of friends at the time (since lost touch), was someone we knew and occasionally babysat as a 10yo, 30 years ago. I haven't seen her since, but she was pretty smart then and has gone onto bigger and better things. At the end of the detour, I reached the Buddong Falls Picnic Area in light rain and feeling quite cold because of the elevation I had gained in the last 10km. I found the signage surrounding the detour a little confusing but, with the help of my GPS, worked out the most likely route which was proved correct. For the next few kilometres, the route followed foot trails and old firetrails that overlooked the continuous rocky cascades of the rushing Buddong Creek in the forested valley below to reach Buddong Hut. The Hut looked the same vintage as many of the cattleman's huts on the alpine High Plains, but was in poor repair, probably because it was accessible by forest road. There had been goldmining in the area many years ago and that may have led to the building of the hut. Despite the cold (now around 1200m altitude) and occasional showers, I found the next 10km of trail some of the most attractive so far. It was a well-marked foot-trail most of the way crossing a high alpine plateau populated with snow gums and a tussocky undergrowth. It was easy walking and evidence of brumbies (wild horses) was abundant in large piles along the track. Probably one of the reasons it was well-worn. I didn't see any brumbies, but imagined I occasionally heard the sound of hooves or a distant snort. There were some fresh tracks, so they were definitely around. I kept moving briskly to generate some warmth as I walked and toyed with the idea of stopping and adding some layers, but survived OK. Soon after 4pm I emerged on the shore of the very pretty Paddy's River Dam, a beautiful alpine lake, and followed its shoreline around to the Campsite. I quickly set up camp, had a wash, and cooked some dinner wearing pretty much all of the clothing I'm carrying. After dinner I updated my diary and prepared for what is going to be a very cold night. 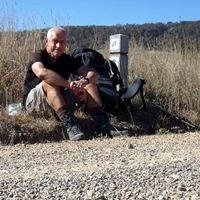 I am booked into a motel in Tumbarumba tomorrow night but have a longish day (28km) before I reach the road down which I'll have to find a ride to town.